A six-month trial of live CCTV on a London bus route has begun. London Mayor Boris Johnson announced that the technology had been installed on 21 double-decker buses on a north London route. 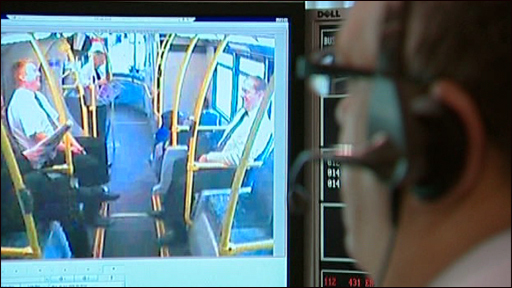 The real-time images will be beamed to a control room manned by Transport for London (TfL) and police. The trial will be monitored to determine whether live images can help transport staff deal with disorder more effectively. Mr Johnson said: "I am determined to banish the sad minority of hoodlums and trouble makers that have blighted our buses. "Having the facility to access live pictures from buses travelling around the capital will mean our bus controllers can play a far more effective role in sending police officers to sort out troublemakers. "If this trial is successful then we will consider rolling out the system on other routes as part of our campaign to stamp out the casual disorder that led to a culture of fear on public transport." Andy Thompson, of London Buses, said: "While crime is low on London buses, we know there is more to do, which is why we are always looking at ways to improve safety, and our passengers' perception of safety, while they travel on our network." Currently there are 60,000 recordable CCTV cameras operating on the 8,000 London buses. The images can be downloaded on request.